Nedo X-Liner 2. Self-levelling cross line laser with one vertical and one horizontal line. 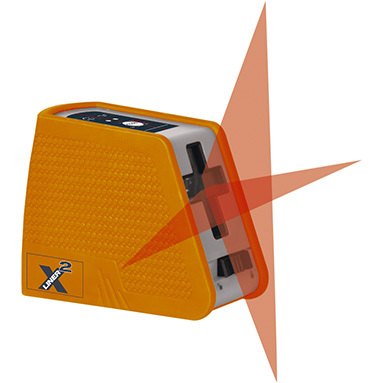 The highly visible laser cross on the wall allows rapid and precise levelling and alignment. Thanks to the pulse function, the X-Liner2 can be used with the ACCEPTOR line laser receiver (available separately) even in adverse light conditions. Self-levelling cross line laser level for levelling and alignment. Highly visible horizontal and vertical laser line, can be activated separately. Pulse function for use with the ACCEPTOR line laser receiver (available separately). Universal adapter with strong magnet and 1/4’’ and 5/8’’ mounting thread. Cross line laser Nedo X-Liner2. Universal adapter with 1/4’’ and 5/8’’ mounting thread and magnet.